Integrated stormwater management requires a new type of collaboration and a change of practices beginning from the strategy and master-planning phase all the way to the realization phase. 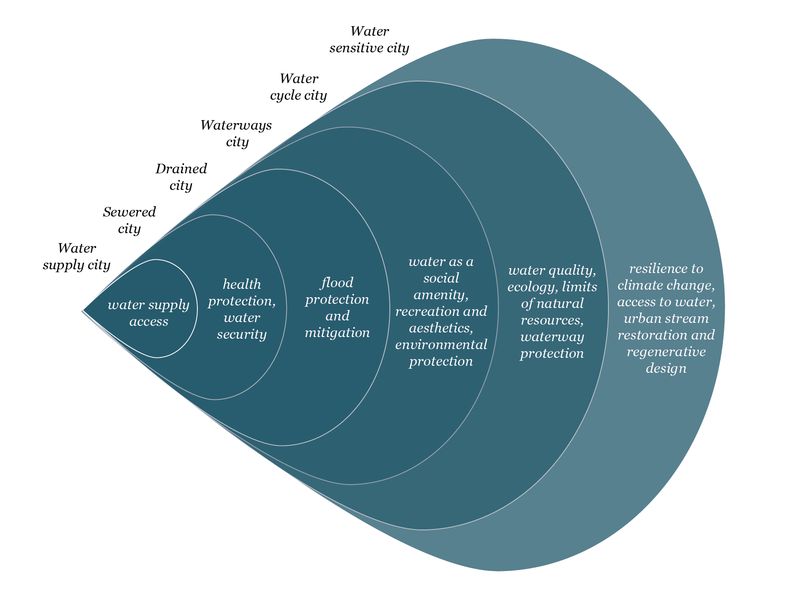 The purpose of urban water management has become broader over time. While flood mitigation remains important, there are many other issues that water management influences. The tools for water management have changed from pipe-based drainage systems to multifunctional systems to meet diverse objectives, including social and ecological aspects. In Europe, most stormwater management practices have traditionally only considered the design of separate and combined sewer systems. Considering urban flood risk management, the systems have been designed to receive the flood return period over a range of 5-10 years (Fratini et al 2012). However, it has lately been realized (and through reference cases learnt in practice) that this is insufficient. One of the solutions offered is to create a system in which the above-ground system has a stronger role – and in which the above-ground and below-ground systems are integrated. To deal with these issues, new knowledge and collaboration are demanded. The concept of integrated storm water management is used to describe a comprehensive, ecosystem-based approach to stormwater management. By integration in this context, we mean the interactions and influence of the human system with the technical system, as defined by Rauch et al (2005). Here we could still add the interaction with the natural environment. Integration is about participation (partnership), interdisciplinary teamwork and nature-based solutions, as well as multifunctionality. Integrated stormwater management requires a new type of collaboration and a change of practices during the whole process: from the strategy and master planning phase to the realization phase. In the current practice of urban planning, elements above ground (buildings, streets and open spaces) are completely defined before the infrastructure below ground is sketched. The sewer system is not competing for space in the surface because it is buried. The topography of the site is not taken into account in the first design stages, since the slopes needed for the optimal functioning of the sewerage can be freely created below ground. The integrated stormwater management approach demands integration of the drainage system into a multifunctional green infrastructure above ground. The sizing of the infrastructure will determine the space it requires and since it is not buried, it will compete for space with other elements on the surface. Therefore, when using integrated stormwater management, the design and size of the drainage together with the topography for the new land uses should be taken into account in the very first planning stages. This cannot be done by only one profession, but requires the involvement of several different stakeholders. Photo: Green stormwater infrastructure integrated into the streetscape in the Skanssi area in Turku. Responses to climate change cannot solely be based on technological improvements, but instead by an increasing focus on social awareness and environmental issues (Fratini et al 2012). The development of new methods and techniques for the management of rain events at different intensities is one of the missing loops of the sustainable stormwater management chain (Haghighatafshar, S. et al, 2014).